When Chennai Express broke the record of 3 Idiots, many in the trade felt that it would be an uphill task for films like Dhoom 3 and Krrish 3 to surpass the 227 crore figure. After all, the Shahrukh Khan starrer had collected 100 crore in 3 days and 150 crore in its first week itself! But a quick comparison between the 7 day (first week) business of the two films reveals that Krrish 3 is ahead of Chennai Express at the moment. Note: The Hindi version of both films released on approximately 3700 screens. While Krrish 3 was affected by the Pre-Diwali period in its first 3 days, Chennai Express benefitted from national holidays for Eid and Sunday. However, business of Krrish 3 took a massive jump Post-Diwali which is considered to be as lucrative as ‘Eid’ for films. Comparison graph of the first 5 days and also detailed day-wise collections of Krrish 3 and Chennai Express in the table below. The table will be updated everyday. Very Nice article and fair comparison. I hope the doubts and confusions of many people have been cleared now. Great work, Indicine team! One thing is sure, both CE & K-3, have been record breaking, as records are meant to be broken. K3 has 60 percent chances of beating Chennai Express record. But for me, it’s more important that Krrish 3 is a better movie than CE. So it deserves . Nothing left to say, fact is fact and no body can change by barking like dogs about Krrish3. Hrithik rocks. @bhumi repeat value of K-3 is more as you can see it that it has got highest collection on Monday and that too on 4th day so without repeat audience it would not have achieved it!!! 250 cr for sure !!! Krrish 3 Will Easily Break CE’s Record ! Remember Another superb Weekend With All-India Holiday Is There For Krrish 3 ! Sachin’s Last Test, Thor 2 Will Not Effect Krrish 3 That Much ! Sorry SRK fans, Before Disliking It Think Twice ! krrish 3 will break ce record then dhoom 3 will break krrish 3 then jai ho etc. goin on and on.so whats big deal.we should support good films,thats it.i just loved krrish 3. CE’s 4th n 5th day was non holiday whereas K3’s 1st n 2nd day was starting of holiday, which means many schools/college/office was closed…. n for CE u have written Saturday as holiday, but wasn’t there holdiay too in saturday for k3? I dont know how to react when people say hrithik is bigger than srk…JOKE!! Baap baap hota hai aut beta beta. n btw most important thing CE released in 1600 screens from its 7th day!!!! but k3 will never break CE’s record acc. to boi!!! 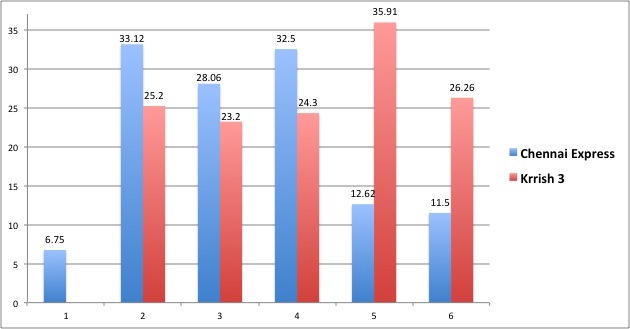 @Yash, above the comparison graph, we have also included figures of Hindi version only. We think the comparison is fair enough, as we have included business from ‘paid-preview’ of Chennai Express to the total. Both movies are equally deserving. Many people said CE can’t even beat YJHD, the aftermath is known to us all. Likewise with Krrish:3. @indicne tell me.. why so much difference in figures compared to BOI??? 35cr. of difference in 5 days..how??? Well, that’s really suprising. 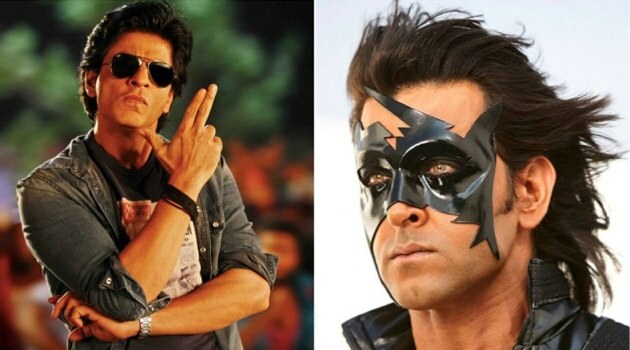 Even after having many disadvantages, krrish 3 has done a fantastic at the BO. Congratulations to both hrithik and the team. K3 break every records of CE except 1st day & weekende. SORRY all hrithik HATER, you all are doing very good job to spread negative about krrish3, i salute your heard work. But you all failed. Best of luck for HRo next film BANG BANG.